Using accelerometers to record movement and behavior of aquatic animals. Home » Blog » What’s Cracking in Tracking? I guess the word “accelerometer” might conjure images of the CERN Hadron Collider or of Captain Kirk yelling orders to his engineers on an old episode of Star Trek. However these devices are becoming increasingly main stream, and most people will have used or at least heard of the smart-phone apps that allow you to monitor your own activity levels while jogging, or impress your friends with the scariness of the rollercoaster you just rode on. Increasingly, the same devices are being applied to more-scientific pursuits, and marine biologists are using accelerometers to make all sorts of fascinating discoveries with aquatic animals. 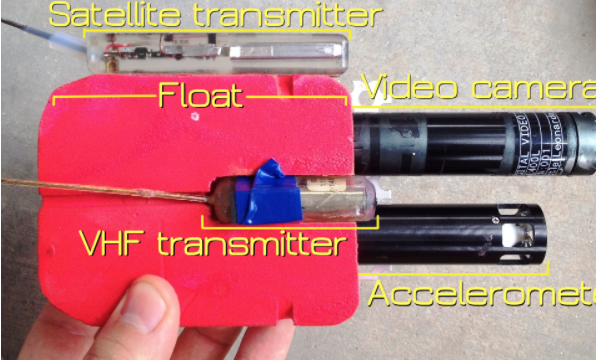 Motion in the ocean: how can you use an accelerometer on a wild aquatic animal? It’s one thing to strap an Iphone accelerometer to your arm and measure your activity levels while you’re at work; it’s quite another to attach an accelerometer to a restless 4m tiger shark and then retrieve the device after it’s been swimming around in the ocean for a week. As a consequence of the challenges associated with working in aquatic environments, scientists have developed a variety of very clever ways to acquire accelerometer data from free-swimming animals. The most common approach is to attach the logger to a float with a timed-release mechanism, so the device automatically detaches from the animal and floats to the ocean surface (Similar to PAT tags). A small satellite and/or VHF transmitter can then be tracked so that the entire package can be recovered. An example of a retrievable accelerometer package. The accelerometer (lower black cylinder) is embedded in a float (red) which brings the package to the surface when the automatic release is activated. The location of the package can then be followed via satellite (top) and VHF (front) transmitters. This package also included a video camera (upper black cylinder) to provide point-of-view insights. Another approach is for the acceleration data to be logged by underwater listening stations (receivers) after the data is transmitted acoustically. The advantage of this approach is that the listening stations are recovered rather than the transmitter, so floats, timed-releases and satellite/VHF tags are unnecessary and the accelerometer package can be much smaller (see below). But the downside is that the animal must be within 500m or so of the receivers for data to be collected, and far less acceleration information can generally be obtained. 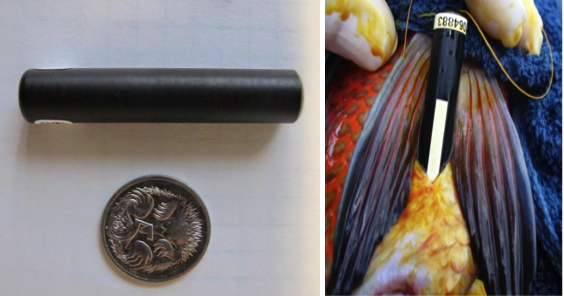 What can accelerometers tell us about aquatic animals? You can tell a lot about an animal by the way it moves. If we know the magnitude of accelerations in an animal, it can give us an idea about how much energy it is using, whether it is feeding, evading predators or resting, and even what angle it is swimming at (thanks to gravitational effects). So far accelerometers have been deployed on a huge range of aquatic animals: sharks and rays, whales and dolphins, bony fish, seals and penguins – even crabs! As the technology is becoming more sophisticated, so is the quality of information that the devices provide. We are now seeing accelerometers being coupled with magnetometers and gyroscopes which allow researchers to recreate the three dimensional orientation of animals in aquatic space. Video cameras are also being used alongside accelerometers, and this combination helps understand what the acceleration signals mean, i.e. images of prey can reveal if burst accelerations are associated with predation attempts or other behaviours. Newer technologies like accelerometers are helping scientists answer questions of wild animals that were rarely asked a decade or so ago. While satellite tracking or acoustic telemetry is informative for questions of “where”, accelerometers can reveal what an animal is doing, and even how it’s doing it. Spying on animals has never been easier. Or more interesting. Researchers attached cameras and accelerometers to Hammerhead sharks. Article supplied by Nick Payne, University of Roehampton.